Stockton and Modesto drivers should know that Tracy Mazda is helping out with the Mazda Drive For Good Program. Working with NBC Universal, the program aims to raise money for worthy nonprofits, and the team here at Tracy Mazda is proud to have the opportunity to do their part. Mazda works with NBC Universal to provide nonprofit organizations across the United States with much-needed contributions in the form of goods and services. 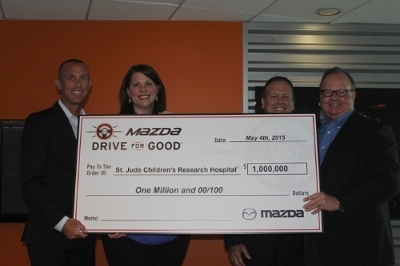 Mazda has announced that its working with four national charities in addition to 40 local charities. In addition to monetary contributions for each Mazda sold or leased, Mazda will pledge one hour of charitable service in 2016 for every test drive taken as part of the Drive for Good program. NBC is also holding a contest where people are invited to share their story of how they give back to the community, along with their vision for how they can improve their efforts and how NBC can help. This will be the third year that Mazda has committed to the Mazda Drive for Good program, and it’s already helped out immensely across the country. Last year’s winner of NBC’s contest was middle-schooler Braedon Mannering, whose organization (3B, or Braeden’s Brown Bags) donates clothing, food, and books to the homeless. Mazda has also announced that, from November 23 to Jan, 4, it will donate $150 for each new Mazda that is sold or leased. This additional effort is part of an ongoing program that has generated $7.9 million for charity thus far. Sacramento Area Mazda Dealers such as Tracy Mazda have always taken pride in giving something back to the local community, and our participation in the Drive For Good program attests to that. Just last year, we were able to present a donation equal to $20,000 to UCP of Sacramento and Northern California, an organization that is dedicated to offering a helping hands to adults and children with all types of developmental disabilities. We look forward to giving again this year! At Tracy Mazda, we consider ourselves something more than just another car dealership. If you know of a nonprofit that has touched your life, don’t hesitate to get involved in the Mazda Drive for Good program or contact us for more information.